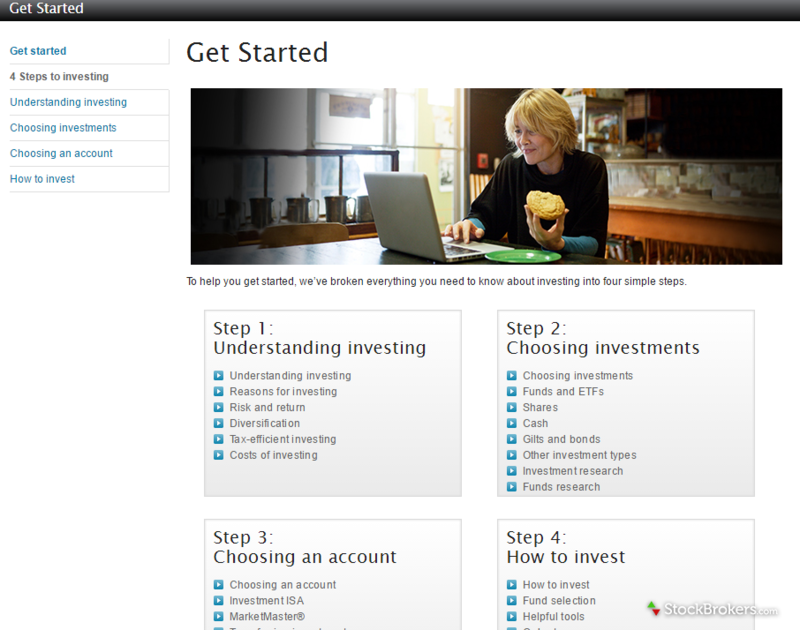 Barclays is a reputable “one-stop shop” for share dealing and investments. Barclays is a household name in the UK as a major global financial services provider, with a history spanning more than 300 years. Barclays Stockbrokers was established in 1986 and is part of the parent Barclays Bank Group. Barclays Stockbrokers, as an execution-only service, has won numerous industry awards for the execution side of the business and its provision of SIPPs and ISAs. Barclays Stockbrokers offers its clients access to a broad range of investments, including funds, equities, gilts, corporate bonds, exchange traded funds (ETFs), and much more. Investors have a choice of investing in more than 2,000 funds from over 100 fund managers. Barclays Stockbrokers has a dedicated UK-based client service team. The Barclays Bank Group is a publicly listed company on the London Stock Exchange and is one of the largest on the FTSE 100 (the 100 largest companies by market capitalization). Its ticker is BARC. Barclays SmartInvestor charges two separate fees for each account: transaction fees (dealing charges) and customer fees (custody fee). Dealing funds, unit trusts, and open ended investment companies (OEICs) costs £3 per transaction, with automated monthly or quarterly purchases costing just £1 per transaction. Dealing other investments such as shares and ETFs costs £6 per transaction. All charges are flat-rate regardless of the portfolio value or account activity level. Annual customer (custody) fees are 0.2% for fund positions and 0.1% for other investments (shares, ETFs, etc). There are no customer fees assessed for cash held in the portfolio. Here’s an example portfolio breakdown. The research area within the MarketMaster platform is impressive, with a wealth of data, including a strong technical analysis area (with which we have been particularly impressed and will look at in more depth in the Platform & Tools section). 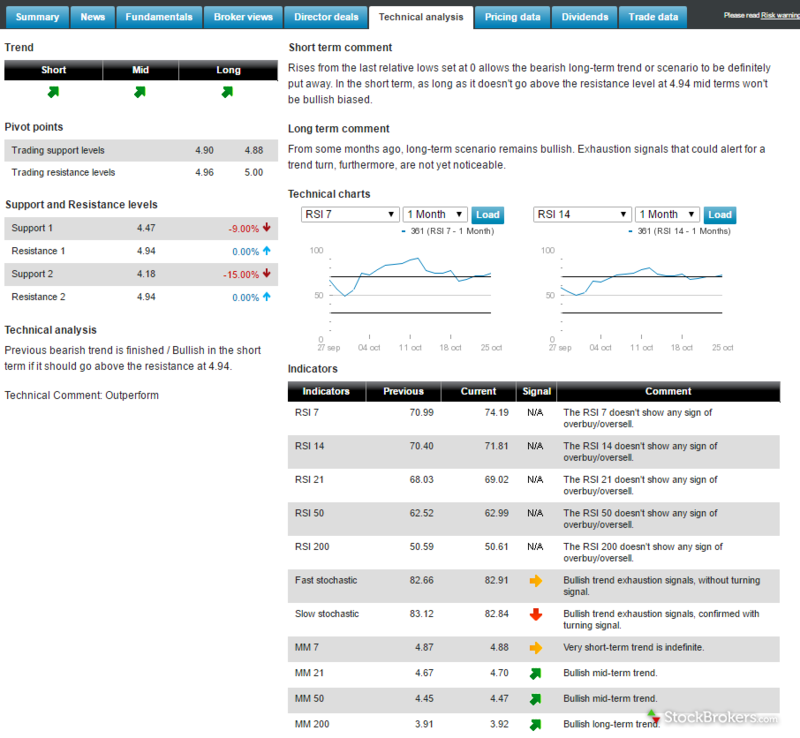 Fundamental data on individual stocks are set out within the traditional tab layout, and it is easy to view a depth of information, including a summary page, recent news, financial data, fundamental data, directors’ dealings and broker views. 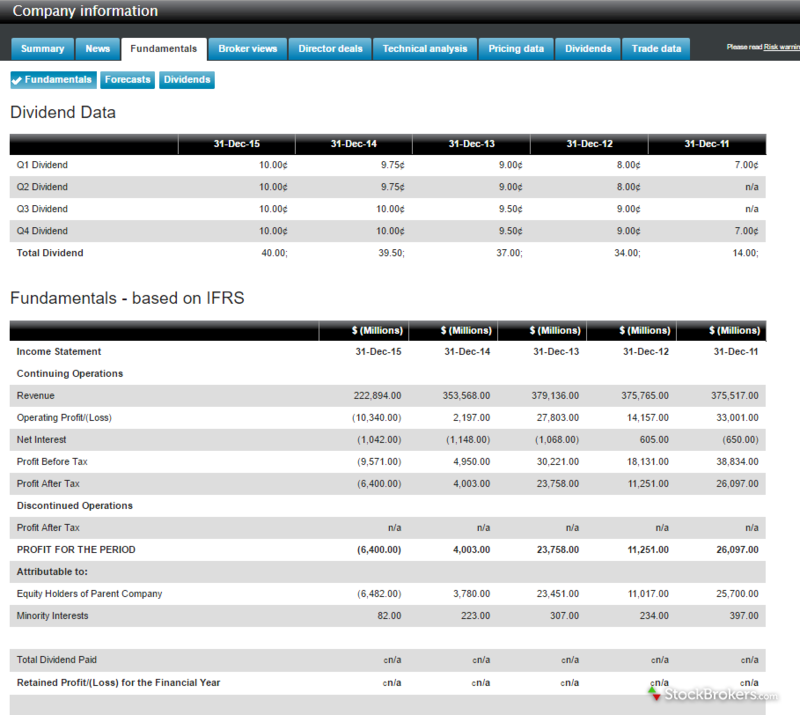 For funds, the research page includes an overall fund summary, performance, holdings, and fund manager profiles. These are all easy to find and view, together with the ability to download a copy of a simplified prospectus/key investor information document. In addition, access is provided to the Citywire Selection, which offers award-winning research and independent analysis on funds. Citywire is an independent financial publisher that has provided investment research and analysis to private and professional investors since 1999. It is possible to search the Citywire Selection by sector. Although this research does not include personal recommendations from Barclay Stockbrokers, it is a useful research feature for Barclay Stockbrokers clients. Furthermore, there is an added bonus on the research side for fixed-income investors. 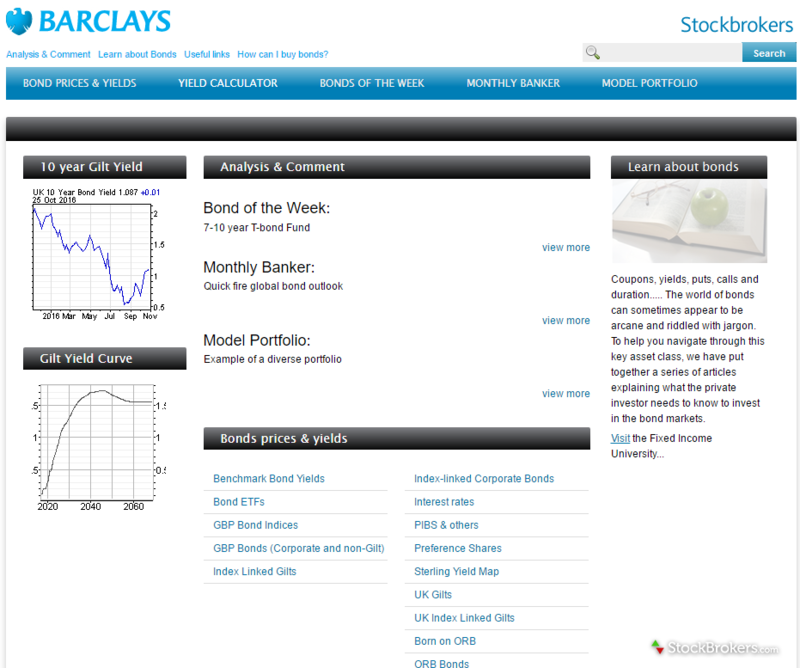 Barclays provides a separate Barclays Gilts and Bonds Microsite, with dedicated research and views on bond markets. Although this site does not go into great depth, it does provide an option to chart gilts and corporate bonds, has a yield calculator, bond of the week section, and a monthly banker section. Compared to the company’s competitors’ offerings, Barclays Stockbrokers’ fixed income information (gilts and bonds) is far more extensive. Furthermore, there is a small “fixed income university,” which provides an introductory education to gilts and bonds. Stockbrokers TV is a video archive, featuring exclusive video interviews from investment professionals, high-profile fund managers, and Barclays Stockbrokers’ experts. The videos can be searched chronologically or by topic. Transcripts of interviews are also available. Finally, on the research side, there’s the Barclays Blog, which provides timely articles on current market activity. All things considered, both new and experienced investors will appreciate Barclays’ educational offering and find it useful and informative. One minor criticism is that the research summary page for individual assets (stocks, funds, or other assets), lacks depth. Compared to Barclays Stockbrokers’ major competitors (for example Hargreaves Lansdown), the individual asset summary page is very basic and sparse, and requires many clicks to find even simple information. Overall we were very impressed with both the extent and depth of the fundamental research data. Barclays finished No. 1 for research. However, overall we were very impressed with both the extent and depth of the fundamental research data. In addition, the technical analysis platform (which we will now review), is a strong feature. The overall trading platform offered by Barclays Stockbrokers is user-friendly, and it is relatively easy to find individual stocks, funds, and ETFs. Furthermore, navigating from the research section or from the virtual portfolio to place a trade is only one click away. However, it is the technical analysis section in which the platform shines, compared to its competitors. Of the major UK online brokers, only IG (segueing in from the spread bet and CFD worlds) comes anywhere close to challenging Barclays Stockbrokers for the top position in charting analysis. This outstanding feature is best highlighted by the number of indicators that can be added to any chart. There are an impressive 152 different indicators, ranging from the basic simple moving average through to intermediate pivot points and further up the niche ladder to Elder Ray Bull Power. There are indicators available that even dedicated, stand-alone, pricey technical analysis packages do not offer. Furthermore, this impressive offering is complemented by 14 drawing tools, from basic trend lines through to Fibonacci Arcs. You can also add your own comments to a chart. However, a disappointment was the inability to compare individual stocks or funds with other assets, which is a common feature on many other competitor platforms. Besides the ability to conduct your own individual technical analysis on any investment vehicle or market, there is also a useful technical analysis tab on the overall summary page that traders or investors can use for third-party input if they are not keen on performing their own charting analysis. This summary screen offers basic support and resistance levels, short-term and longer-term trading views from a technical standpoint, momentum indicator analysis, and automated bullish/bearish and overbought/oversold signals. A minor irritating drawback, despite the notable array of technical analysis indicators and drawing tools, is the inability to simply add a stock fund to the virtual portfolio (effectively a watch list) from either the chart or research summary page. However, together with its strong fundamental research section, the Barclays Stockbrokers technical analysis and charting platform is a highly attractive research package. The absence of any mobile trading application via iPhone, iPad or the Android store is disappointing for such a large provider of online trading and investing services in the UK. The absence of any mobile trading application via iPhone, iPad or the Android store is disappointing for such a large provider of online trading and investing services in the UK. Although there is access to spread betting and a CFD service, a dedicated Barclays Stockbrokers mobile trading app is an absolute necessity for the 21st-century investor and trader. That said, Barclays Stockbrokers tells us a mobile solution is in the pipeline and is due for delivery some time in 2017. We will be sure to update this review with our initial thoughts, once it launches. Barclays Stockbrokers is part of the larger Barclays Bank Group, and with this historic and large parent company comes an added assurance of security. There are no direct benefits to the online user of Barclays Stockbrokers by being a Barclays Bank client. However, the other major bank to operate online in the UK share-trading market is HSBC. To open a share-dealing account with HSBC, which is an InvestDirect offering, you have to be an HSBC current account customer. Education is also a strong feature Barclays Stockbrokers offers. Together with the impressive research area and strong technical analysis platform, there’s an abundance of educational information, delivered in concise but detailed articles that cater for everyone – from beginners through to advanced investors. The information is presented in a user-friendly manner by topic, with a deep archive and search facility. The information is presented in a user-friendly manner by topic, with a deep archive and easy to use search. 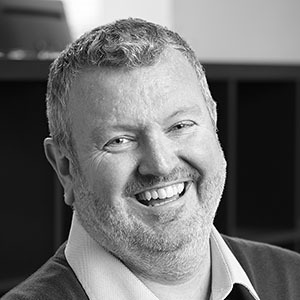 There is an ‘at a glance’ section (to sum up the key points) alongside a ‘things to remember’ section (to help the client understand the risks and a jargon buster) which clearly explains any terms the user may not have come across before. Furthermore, written content is complemented by a variety of videos and infographics which enhances the learning experience (some of this in the Stockbrokers TV area). Overall, we found the education content provided by Barclays Stockbrokers to be high quality, easy to follow, and diverse enough to appeal to all investors regardless of experience level. The fees are on the high side, but this comes with an enormously strong fundamental research offering, a depth of educational articles, and one of the best technical analysis platforms offered in the UK market. In the end, Barclays Stockbrokers made it to the top of our rankings in 2017, despite the absence of a mobile trading platform, which is disappointing in the modern era. Given that the commission levels are at the upper end of the UK market, the trading public should have access to their trading accounts and markets via their mobile devices. Select one or more of these brokers to compare against Barclays. Barclays SmartInvestor charges two separate fees for each account: transaction fees (dealing charges) and customer fees (custody fee). Dealing unit trusts (funds) and open ended investment companies (OEICs) costs £3 per transaction, with automated monthly or quarterly purchases costing just £1 per transaction. Dealing other investments such as shares and ETFs costs £6 per transaction. All charges are flat-rate regardless of the portfolio value or account activity level. Find out how Barclays stacks up against other brokers.